JMI to start Nine New Courses from 2018-19 session - Jamia is all set to introduce nine new courses from the year 2018 and these courses will be offbeat which will not be frequently available to students in most Universities. According to an official, these courses will be different from the usual courses which are consistently available in the University and in other Universities as well. Furthermore, these courses will help the students to acquire an opportunity to study such courses which they will not get at other Universities. The application process for admission to the Undergraduate and Postgraduate programs at Jamia Millia Islamia University will start from 2 February 2018. There are around 7000 seats available for the students for these programs in the University. The eligible candidates will be able to fill the application form until 7 March 2018. The candidates will also get a chance to make corrections in their filled in application forms. Every year, the University conducts an entrance exam for the candidates for admission to different courses at the University. There are also interviews held for entrance for some of the programmes. The entrance exam and interviews date are not announced yet. As for now, the application dates are known. Jamia Millia Islamia University will start nine new courses from the upcoming academic session. According to an official, these courses will be different from the usual courses which are consistently available in the University and in other Universities as well. Moreover, these courses will help the students to acquire an opportunity to study such courses which they will not get at other Universities. Out of those nine courses, two are MSc in Disaster Management and Climate Sustainability Studies and Master of Library and Information Science. There are also two Diploma Courses, out of two one is in Labour Law and other is in Air Space Law. There is also one Diploma programme in the Korean Language. The total number of seats for each course will be 20-30. These courses will be self-financed. The decision for starting these courses was finalised by University’s Academic Council. 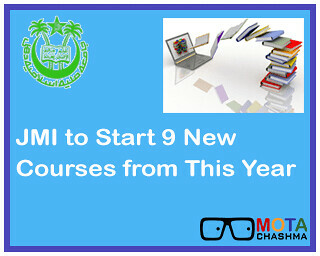 Last year also JMI started six new courses. These courses included International Relations, Pharmacy, Tourism and Travel Management. There are 40 seats in Diploma in Pharmacy course. There are 30 seats in other courses like MA International Relations (West Asian Studies), LLM (Executive), Bachelor of Hotel Management (BHM), Bachelor of Tourism and Travel Management (BTTM) and Masters in Tourism and Travel Management (MTTM). All these courses are also self-financed except MA (International Relations- West Asian Studies). The duration for the postgraduate and Diploma courses is two years, whereas the undergraduate programs are of four years.